If you have a sweet tooth, you would probably understand that a meal would not be complete without a dessert. Desserts are said to be the conclusion of every meal, may it be a breakfast, lunch, or supper. The term dessert refers to a wide variety of confections, such as cakes, cookies, custards, ice cream, tarts, puddings, and a lot more. Because there is an unending list of desserts that you can choose from, restaurants, cafes, and shops must present their own list of dessert through a menu. 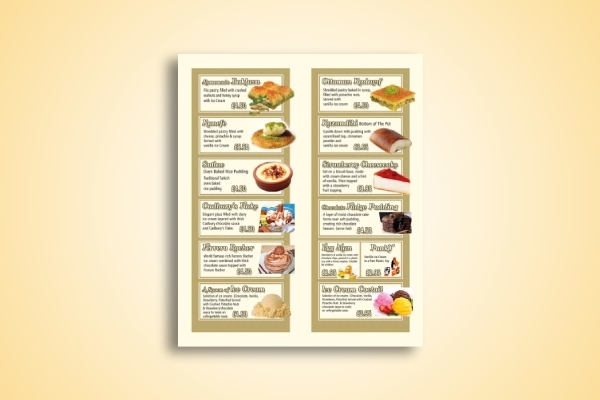 A menu helps and guides the customers on the available desserts that they can choose from as well as the corresponding prices for those items. This can also be a good way to establish your branding when you design a menu that best represents your company. So, to help you create a presentable and striking dessert menu, provided below are examples and templates that you can use or refer to. If you are a company offering great dessert food, you surely have a huge market since a lot of people love desserts after their meals. 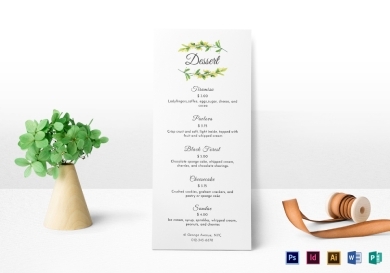 Take advantage of this great opportunity and create your own menu now with the use of this elegant dessert menu template that you can easily edit and customize according to your specific needs or preferences. You have a lot of options where to edit the file as it is available in many file formats, such as Illustrator, InDesign, MS Word, Photoshop, and Publisher. This is a professionally crafted menu so you are guaranteed high-quality graphics and designs that would make your menu elegant and decent. Been busy designing your marketing materials and collaterals? Apart from your flyer templates and posters, you must also take time in creating your menu, especially for your desserts. 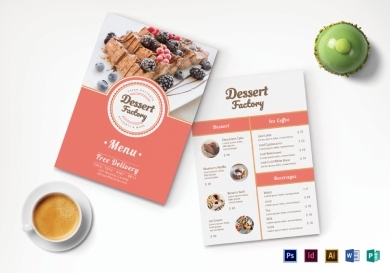 Whether you are a graphic designer or not, you can use this simple dessert menu with ease because there are a lot of options that you can choose from the available file formats. You can incorporate your name and your company logo or other branding elements that are related to your company, a list of the desserts that you are offering, and the respective prices of those items on the list. If you have promos, do not forget to include this in the menu as this would capture the interest of your customers. The elements of a basic dessert menu include the following: the title of the menu, for example, jellied desserts, frozen desserts, or pastries; the name of the food in the menu, which must be captivating enough in order to entice people to try that food; the price of each food, which must be presented in a subtle way; and high-quality photographs of those food. Your main goal when you present a menu is to make people interested in your desserts, so make sure that the images you incorporate are not far from the actual presentation of the food so you won’t disappoint customers. Frozen desserts, although cold, is said to be a warm blanket on a cold winter evening. Ice cream, shaved-ice desserts, gelato, and sorbet—these are just some of the many desserts that fit into the frozen dessert category that you can offer to your customers. 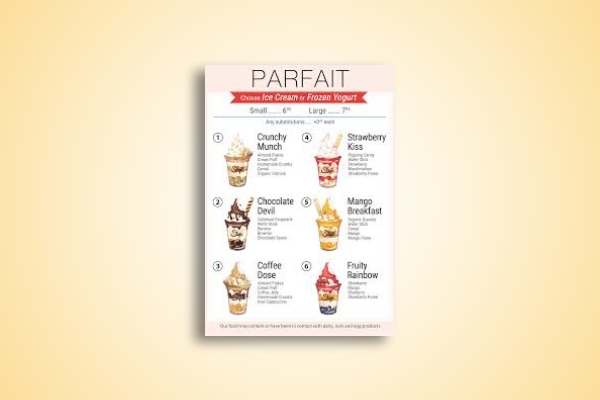 Present them a frozen dessert menu, similar to this example, and include all your available frozen desserts and their corresponding images. Make sure that your images are in high quality and are professionally captured as these can affect the impression of the customers regarding the food that you are offering. A poor-quality photo in your menu may mean that you are not putting extra effort to achieve a well-crafted marketing material. Indians are said to have a penchant for sweets because desserts are not only part of their staple fare but also offered to their places of worship as an integral part of their sacred offerings. Among the popular Indian desserts are gulab jamun, sandesh, aam shrikhand, kaju katli, shahi tukda, and puran poli. So when you are an Indian cuisine or restaurant, you might consider including these desserts in your menu, such as the Indian dessert menu example presented above, and encourage customers to try them by including a well-captured photo of the food. It is undeniable that desserts give a befitting end to any meal. It is the climax to a spectacular movie that makes us go weak in the knees. So, it is important that you offer this great food to your customers and let them experience an unforgettable sensation as they partake your best desserts. 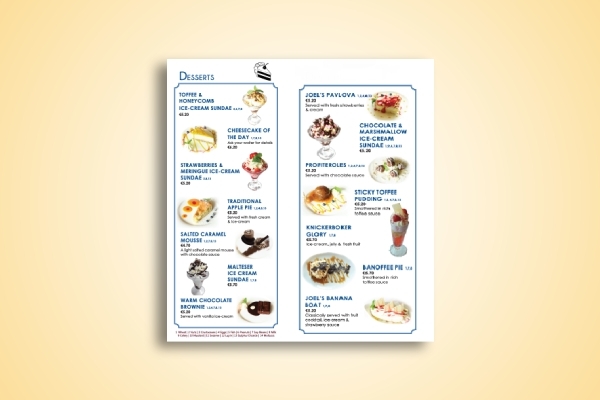 Lure them to try your dessert bestsellers through well-designed dessert menu, just like this restaurant menu example, and give them the best offer that is hard to refuse. 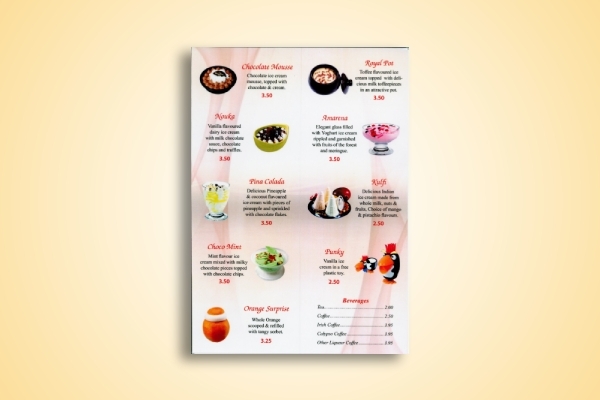 You can create a tangible or printed version of your menu or a digital or online one where they can browse and order a dessert online.